James Joyce (1882–1941) broke with his native Ireland and with late Victorian conventions to shape a new life for himself and a new literature for his time. His early life was unsettled. Moving to the European continent in 1904, he wavered among careers, considering medicine, law, banking, classical singing, wool merchandising, and managing a theater troupe, in between stints of writing and language tutoring, as he worked on his early short stories, poems, and finally novels. 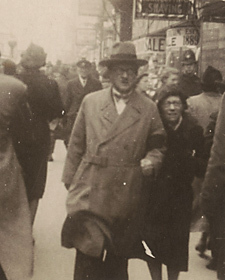 Until he came to the attention of vigorous advocates and patrons such as Ezra Pound and Harriet Weaver, his finances were in chaos, and the combination of financial pressures and World War I drove him to move around from Pola to Trieste to Zurich, bringing his young family with him. From 1917 onward, he was also increasingly troubled with major eye problems, and his eyesight deteriorated even as the breadth of his literary vision expanded. Yet in the midst of these instabilities, or perhaps partly because of them, Joyce shaped an entirely new literary style. He focused on small incidents and moments in the lives of ordinary people, and yet he made those moments both universally appealing and profound. He elevated the stream-of-consciousness technique to a new art form. Joyce s work did much to define the modern period in British literature. The crucial, chaotic, productive years of Joyce s early life are richly documented in the Cornell Joyce Collection. The collection contains sixty-three manuscripts, including working drafts and typescripts of Ulysses; first editions of his works; and a trove of letters between Joyce and his wife Nora, his brother Stanislaus, his patron Harriet Weaver, and his fellow writers, including Ezra Pound, W.B. Yeats, and George Bernard Shaw. The bulk of the collection covers Joyces early years, through the publication of Ulysses in 1922. Found at the time of his death in the home of his brother, Stanislaus, the collection was purchased for Cornell largely through the generosity of William G. Mennen, Class of 1908, who also donated a number of significant rare books to the Library.